I grew up with the Horses of Half Moon Ranch books. Or rather, I read them while I was a horse crazed child. One summer I spent each day of the holiday reading a different book in the series. It sounds sort of sad now as I barely went outside that summer. I’m now having a sort out of my books and getting rid of a load, but I’m reading them one more time before I do so. 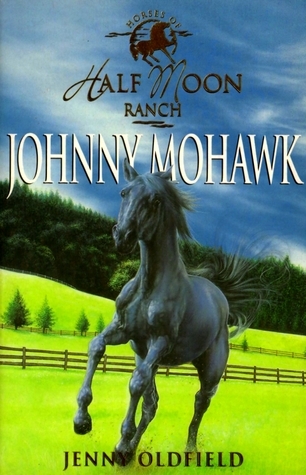 The series is set on an American ‘dude’ ranch and in this book a guest is thrown from a horse and his overbearing father threatens to sue the ranch. Kirsty is desperate to get to the bottom of what happened and prove the horse’s innocence, being blindsided to any other possibilities, while her best friend tries to look on the human side of things and tries to help the boy that came of the horse with his relationship with his father.This is a quick and easy read that as a child, took me a day to read and as an adult (if you believe I’m one) takes about an hour. The chapters are all around ten pages each and all have pictures towards the end of each chapter to help set the scene. You don’t have to put any thought into the book at all and its story is quite superficial but being a children’s book, do you really need anything more?I read this a few times as a child and quite enjoyed it each time. It wasn’t too impressive this time around, but I am no longer the target audience. I would recommend it to young children who like horses. This was a short good book that i reed in a week. it was an amazing story that really shows what people will do for their pride. And how loyal horses can be. One of the many books about horses that were forced upon my by my mother. It was okay, I suppose. I think it would have had more impact on me, had I actually wanted a horse. Jenny Oldfield - Jenny Oldfield was born in 1949 and brought up in Harrogate, Yorkshire, and studied English at Birmingham University.She has written a large number of books for both children and adults, including the Home Farm Twins, Animal Alert, and Half Moon Ranch series. A horse enthusiast, many of her novels feature horses and are popular among young horse fans.Jenny has also written under several pseudonyms: Jasmine Oliver, Donna King, Kate Pennington, Lucy Daniels, Sable Hamilton and Kate Fielding.